The first thing that caught my eye on “The Name of the Wind” was the synopsis, which states: “My name is Kvothe. You may have heard of me.” And so indeed I did heard of him and of Patrick Rothuss’ debut novel. All the reviews and the information of the novel put it in a favorable light and that raised my expectations for this novel. The reader is introduced in the beginning to the Waystone Inn and its innkeeper, Kote. But the regular and amiable innkeeper is only a mask for Kvothe, a man who wanted to be the most powerful wizard and who wanted to find the name of the wind. With the apparition of the Chronicler at the Waystone Inn Kvothe starts to recount the story of his life. From the childhood spent along with his parents in their traveling troupe of artists, through the streets of Tarbean as a homeless and poor child to the days of his adolescence at the University. The novel of Patrick Rothfuss is like a fortune cookie. We have the actual cookie baked from sweet and delightful dough and the message baked inside the cookie which makes it interesting. The message is the story of Kvothe, told from the first person perspective. Using the first person Patrick Rothfuss brings the reader more closely to the main character, Kvothe. And I came closer and closer to Kvothe throughout his early life told in the pages of “The Name of the Wind” the first part of “Kingkiller Chronicle” trilogy. All I can think of at the end is that the childhood and adolescence of Kvothe is the story that every child dreamed of living if he was supposed to choose one, except the violent and unfortunate part I believe. What I also really liked at Kvothe is how his feelings are caught and described, grief, fear cover by an apparent confidence, the young lover unrest. And also how he deals with the school bully, which can be quite amusing sometimes. Patrick Rothfuss shows us glimpses of his fantastic world, but the world building is sacrificed to the main story. However even though the world building is touched only briefly I liked what the author showed me so far. I liked the religious aspect which involves a main God figure and some religious conduit imposed. I liked that this world has legends and a history behind it. And these aspects are reflected on the local traditions and local holidays, like the Midwinter Pageantry or Harvest festival. I liked that the inhabitants use different languages depending on their nationality. But like I said all these aspects are touched superficially and all I can hope is that they will be developed in the next novels. Another interesting aspect is the magic system, but this one too is sacrificed to the main story. Except here I’m certain that will be a development in the novels which will follow “The Name of the Wind”. I’m hoping and I’m waiting because runes, the binding of runes and using the true name of things sound impressive and attractive enough for a magic system. “The Name of the Wind” suffers a great deal at its rhythm. It is a fantasy novel, but it doesn’t fall under the category of action fantasy. It is more of a coming of age and a development of a character, building it for his farther adventures. None of the less I was entertained by the novel and I got a great portion of adventures, but sometimes the rhythm is slowed down. Fortunately the slow moments of the novel don’t last long and are followed if not by an action moment by an interesting one for certain. And the end of the novel is a teaser leaving me in a long expectation for the following novels. 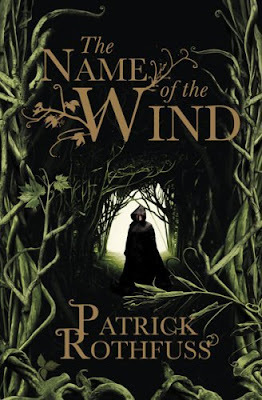 With “The Name of the Wind” Patrick Rothfuss makes a strong debut and with a debut such as this one I know for certain that fantasy literature has a bright future. So I didn't promise you too much.